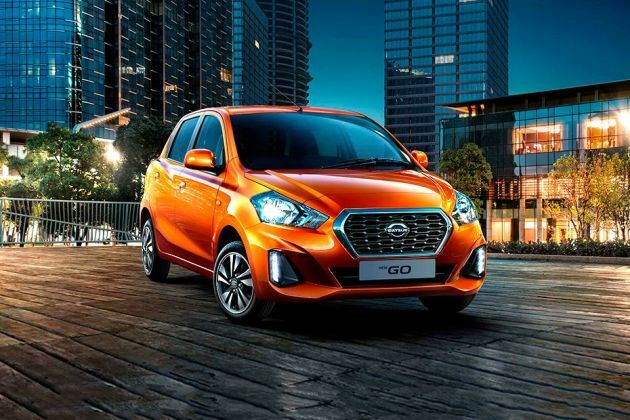 Datsun India has silently launched a new trim in its hatchback series Go in the country. It is christened as Datsun Go T Option . It is currently the high end variant and comes with an added feature in the form of driver airbag. Powering this trim is the same 1.2-litre, 3-cylinder DOHC based petrol engine that has the capacity of displacing 1198cc. It enables the vehicle to produce a peak mileage of 20.6 Kmpl, which is rather good for this class. Apart from adding an airbag, the manufacturer has made no changes to the vehicle. It has a very attractive body structure featuring a lot of chrome inserts on it. Being the top end trim, it is bestowed with several comfort aspects like air conditioning system with heater and filter, gear shift guide, speed sensitive power steering, front power windows, mobile docking station and much more. The interiors of this trim are quite spacious and have been done up with quality material. This hatch can provide seating for five passengers comfortably. As far as safety aspects are concerned, it is equipped with functions like child lock system, engine immobilizer, manual central locking, front disc brakes, front and rear seat belts and so on. It is competing against the likes of Maruti Celerio, Chevrolet Spark, and Hyundai Eon in the entry level hatchback segment. This newly introduced variant comes with the same body structure without any updates. It has modernistic body design with expressive lines on its front and rear profiles. Its front facade comes with a stylish look and designed with a trendy headlight cluster incorporated with powerful halogen lamps and side turn blinker. In the center, there is a 'Datsun Character Grille' surrounded by a thick chrome strip. The front body colored bumper has a bold design and it comes incorporated with an air dam that helps in cooling the engine quickly. The overall front profile is complimented by the iconic company logo fitted to the honey comb grille. Its windscreen is accompanied by a couple of intermittent wipers. The side profile of this hatch is quite decent and it is equipped with body colored door handles along with ORVM caps. Here, the B and C pillars have been painted in black, while the window sills get body colored paint. The wheel arches have been well molded and they come fitted with a set of conventional 13 inch steel wheels featuring full wheel covers. These rims are further covered with tubeless radial tyres. The rear end of this hatch is very attractive with the distinctly crafted boot lid and a radiant taillight cluster. The rear bumper too comes in body color and it houses the license plate. The roomy interiors of this top end trim is been done up pretty well and designed in dual tone color scheme. It is incorporated with a lot of interesting equipments along with utility based features. The cockpit is fitted with spinal support based seats, which are connected with each other. Here the front and rear seats come with integrated head rest. All the seats are covered with stylish jacquard fabric upholstery, which adds to the elegance of the insides. The dashboard is quite smooth and distinctly designed. It is equipped with a proficient air conditioning unit along with a heater and vents as well as a three spoke steering wheel. Then this trim also has a spacious open glove box compartment along with a gearbox console. In addition to this, it also incorporated with a mobile docking station that features an amplifier, USB port, AUX-In socket and an accessory power socket as well. There are several other necessary features placed inside like reading lamps, a driver side storage tray and coin holder, passenger side storage tray with bottle holder, a digital tachometer along with a few other utility based features as well. This trim sports an advanced 1.2-litre, In-Line petrol power plant that has an electronic fuel injection system. This engine is integrated with three cylinders, which further has twelve valves and displaces about 1198cc. This DOHC based petrol engine can produce a maximum power of 67.07bhp at 5000rpm that results in producing a peak torque output of 104Nm at 4000rpm, which is rather good. The company has skillfully coupled this engine with an advanced 5 speed manual transmission gearbox that distributes the torque output to its front wheels. The manufacturer claims that this hatch has the ability to produce a mileage of 20.6 Kmpl (as per ARAI standards), which is quite attractive. The company has fitted the front wheels with high performance disc brakes, while equipping the rear ones with conventional drum brakes. This braking combination works efficiently in all road conditions. Not to forget, this top end trim comes incorporated with a speed sensitive power steering system, which offers a precise response to the driver. On the other hand, its front axle is fitted with McPherson Strut type of a mechanism accompanied with double pivot lower arm. The rear axle is equipped with an H-type torsion beam suspension and it is further assembled with high performance linear dampers. The list includes a manual air conditioning system with heater and air filter, front power windows with driver side auto down function, an electric power steering, rear seat bench folding, a digital tachometer, gear shift gauge, remote fuel lid opener, follow me home headlamps and a remote tailgate opener as well. Above all this, the company has equipped a mobile docking station with USB socket, AUX-In port along with an amplifier and a universal mobile holder, which adds to the entertainment quotient of this variant. This top end trim also comes with a drive computer that features an average fuel economy indicator, distance to empty and instantaneous fuel economy indicator. This newly launched variant is blessed with a driver airbag, which improves the overall safety standard of this hatch. Apart from this, it is equipped with crucial safety aspects like an engine immobilizer system that protects the vehicle from unauthorized access. The car maker is also offering this variant with three point seat for the front and rear seats. This trim also has a central locking system, headlamp leveling device and child locks for the doors. 1. Affordable cost of ownership and maintenance. 2. Inclusion of airbag is now adds to its plus point. 1. Lack of anti lock braking system. 2. Several more convenience features can be added.